Έκδοση: 2001 από "Ίδρυμα Παναγιώτη και Έφης Μιχελή"
Since the beginning of time, landscape has inspired artistic creation. 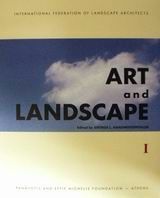 This two-volume compillation of edited articles, written by experts in their field, looks at art and landscape in many guises. Topics ranging from historic landscapes and gardens, through landscape aesthetics and theory, painting, literature, decorative arts, to design using virtual reality are covered, to name but a few. Comprehensively indexed, with many useful references and bibliographies, this publication provides new and interesting insights into the role landscape plays in all the arts.